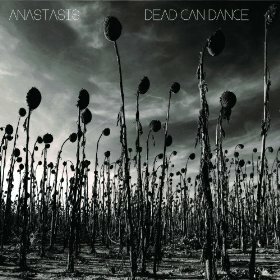 Dead Can Dance are one of a handful of bands from the darker side of early 80’s post punk to fully embody the sound of the then-emergent 4AD record label. The duo of Lisa Gerrard and Brendan Perry shared some aesthetic qualities with their peers – especially the use of cavernous reverb and gothic arrangements – but had a very particular sound in their use of a wide array of ethnic instruments, propulsive rhythms, and chanting, often spoken-in-tongues vocals. It was all quite medieval at times; easy enough to imagine coming from the courts of a castle in the Middle Ages. It’s refreshing in a way that little has changed with Anastasis, the group’s first album in 16 years. It’s rife with exotic instruments, tribal rhythm sections, and hypnotic, ancient melodies. Gerrard was always an overwhelmingly accomplished vocalist and still is – her voice is pristine and stunningly maintained. Perry’s, on the other hand, was always a bit one-dimensional, and that certainly hasn’t changed either, but it’s also no worse. The haunting lurch and Eastern strings of “Anabasis” are an immediate highlight, as are the epic pipes pomp of “Return of the She-King” (I’m positive I’m not the only one who had conjurings of Tolkien at that one), with a dueling vocal from both Gerrard and Perry. The album mostly does the same thing throughout with varying degrees of success – you might get tired of Gerrard’s bravado, but it’s better that her words are indecipherable in comparison to some of Perry’s more stock musings. At eight tracks and nearly an hour in length, Anastasis will likely require some patience on the part of the listener, but it’s an engaging and trance-inducing hour for those who wish to be taken for the ride. A band this stylized always faces the threat of self-parody, but they’re still more royalty than court jester.